A few years ago, my spouse and I began to renovate the semi-finished basement of our 1946 home. I knew upfront what the risks were of trying to make a below-ground space livable. My background in green building had taught me that basements are often unhealthy spaces where moisture and contaminants collect and mold thrives. Indeed, when the remodeling crew removed the basement’s drywall, they found significant mold on the backside and inside the wall cavity--a hidden, but not-uncommon problem in many Minnesota homes. The whole wall space was also saturated with water. What did we do and what can you do? Read on. Most basements in older houses were not designed to be livable spaces. Moisture protection that is common in newer homes is lacking in many older ones, so extra care is required when remodeling. Start with the question: Is it dry? Even a basement that seems dry can have moisture issues. A damp and/or musty smell is a good indicator that moisture--and possibly mildew or mold--are present. Consider testing for moisture and for indoor air pollutants like radon, mold, asbestos, and lead, at both a project’s outset and completion. Testing can help verify if a problem exists and lay the groundwork for the project’s focus and approach. See Minnesota Department of Health’s Guidelines for Selecting an IAQ Consultant for direction on finding a professional. Some solutions can be simple and inexpensive. Keeping gutters debris-free and extending downspouts away from the home are important yet easy ways to keep water away from the foundation and out of the basement. Increasing the grade or slope away from the house can also improve drainage. Correct areas where drainage is a problem. In our case, the sidewalk slab near our front stoop and walkway on the side of our house had sunk, causing water to flow towards our foundation instead of away. This summer we're having drainage pipe installed that will direct water away from the foundation towards a planned raingarden in our yard. Regrading and resurfacing will follow. Repair leaky pipes or other plumbing that might be adding moisture. Seal cracks in foundation walls. Cracks in our home’s foundation weren’t visible until the drywall was removed. Even tiny cracks can let in a lot of water! Avoid moisture "magnets" and moisture traps. Products that may work fine in other parts of the house can attract and hold moisture in the basement. Examples include wall-to-wall carpeting, paper-faced gypsum board, wood, fiberglass insulation, and upholstered furniture. Consider alternatives that don't support mold growth, like paperless drywall and moisture-tolerant insulation. Accept that some moisture in basements is a given. Even if standing water is not a problem, water vapor and condensation are still prevalent in basements and can contribute to mold growth. Avoid vinyl or other non-porous wall or floor coverings that can trap moisture. Vent clothes dryers to the outside and make sure that basement bathrooms have exhaust vents. Run an energy-efficient dehumidifier to keep moisture levels in check. 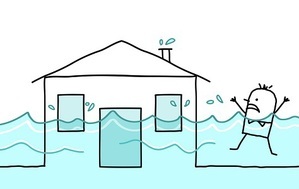 Flooding or other unexpected misfortunes can cause even dry basements to get wet. Consider adding an interior water management system to handle water that gets in. Once your basement space is reliably dry, you can focus on making it a livable part of your home. GreenBuilding Advisor’s Green Remodeling Guide is a good resource for strategies and ideas, as are the REGREEN Residential Remodeling Guidelines. Important considerations include insulation, ventilation, mechanicals, lighting, windows, walls, and flooring, among others. If you plan to hire a contractor or similar professional to renovate your home, look for someone who understands healthy homes principles and has training in green building science. Building science recognizes that a house is a system of interrelated parts, and that changes to one part of the home can affect other parts as well. Professionals accredited under the GreenStar standards understand and can apply green remodeling practices and principals. See Seven Tips for Hiring a Green Remodeler for additional suggestions on finding the right professional for the job. Planning to do the work yourself? It’s still worthwhile to have home performance testing (auditing) done before remodeling begins. An audit can help to identify problems upfront. Getting the best remodeling results for your home and its inhabitants can sometimes mean taking a phased approach. Our remodeling outcome in "phase one" of our project was a basement that was largely returned to its barest state—unfinished, but mold- and pollutant-free. Cracks in the foundation—a major source of water entry—were filled. Ventilation and air-sealing were improved and a radon mitigation system was installed. Our remodeler advised us to postpone finishing the space, though, until we could improve outside drainage. In the four years since then, we’ve monitored the basement for signs of water and run an energy-efficient dehumidifier to reduce moisture levels. We’ve saved money so we can improve drainage around our home’s exterior. We keep our gutters clear of debris so that water doesn’t overflow. And we’re still planning to make our basement a beautiful, green, and livable space once we’re confident that it will stay dry. Completed member applications, along with a resume, must be submitted to mgcapplication.pca@state.mn.us by the deadline of June 30, 2015. National Wildlife Federation's Great American Backyard Campout, Saturday, June 27, 2015. National Wildlife Federation's Great American Campout is a summer-long celebration of camping as a way to connect with nature and wildlife. NWF’s Great American Campout is part of Great Outdoors Month in June, a month designated to highlight the many kinds of outdoor activities that strengthen our bonds with nature. For more information, visit nwf.org/Great-American-Campout. Bioblitz: All About Insects, Saturday, June 27, 1:00-5:00 pm. Join insect experts and enthusiasts for an afternoon of exploration as we discover the insects that call Minnesota Interstate State Park home. This first-ever bioblitz along the St. Croix National Scenic Riverway is sponsored by the National Park Service, Minnesota Department of Natural Resources, and the Bell Museum of Natural History. So what is a bioblitz anyway? Biologists lead an intensive survey to count as many species as possible in a particular area within a set time frame. Citizen scientists can help! Because this is the first effort along the St. Croix River, the BioBlitz will focus on insects only. Guided walks will happen throughout the afternoon and the experts will assist participants catching and identifying insect species. For a schedule of activities, see nps.gov/bioblitz. Festival of Farms - Sustainable Farming Association, July 11, 2015. SFA’s Festival of Farms™ is an opportunity to learn about sustainable agriculture, network within the community, and have fun at various farms across the state. See Festival of Farms for more information including participating farm locations. Are you a cashier? Own a business that uses thermal receipt paper? Manage point-of-sale operations or sustainable purchasing? You may have wondered how to respond to news that thermal receipt papers are often coated with endocrine active chemicals BPA or its chemical cousin, BPS. Whatever your business – from one-register coffee shops to grocery stores, bookstores to national retailers -- you can take action that will make a measurable difference!